Watercolours. Just the name brings up images of delicate florals, foggy coastal trees and muddy messes. That’s right I said it. A big muddy mess. When I was in college, I had the most lackluster instructor as an art teacher. She taught watercolour. She had the personality of a dial tone. “Remember,” she would say (adapt a nasal tone here), “Blue and yellow make green, red and blue make purple… (yada, yada, yada). Now go ahead and pre-mix all the colors on your palette and place them on your scene. Mix plenty of water with it.” I ended up with a muddy green tree next to a muddy blue mountain on a muddy brown hillside. It was a muddy horrible disaster! I had puddles of watery mix that ran everywhere and took a day to dry. My paper billowed up like a messed-up bed. That was my introduction to watercolour, thereby reinforcing a fear of paint, and the comfort of a simple, dry sketch pencil in hand. I mean, if watercolour were an animal, it would have been a slow, dull-witted brown caterpillar, invisibly devouring the white paper and leaving mud in its wake. Sorry, but no thank you. Surprisingly, I returned to the medium several years later, deciding to teach myself. Something about it tickled my imagination. There’s got to me more to it than this. Yep. You bet there is. After some experimentation, using paper and other items collaged on a gesso-covered board, I went crazy with watercolours. You heard me. Crazy with watercolours! Seems impossible? Here’s what I found. If I saturate my brush with paint and hold my canvas vertically, I create a painting that drips with vivid blues and rich browns, splashing the canvas like rain. 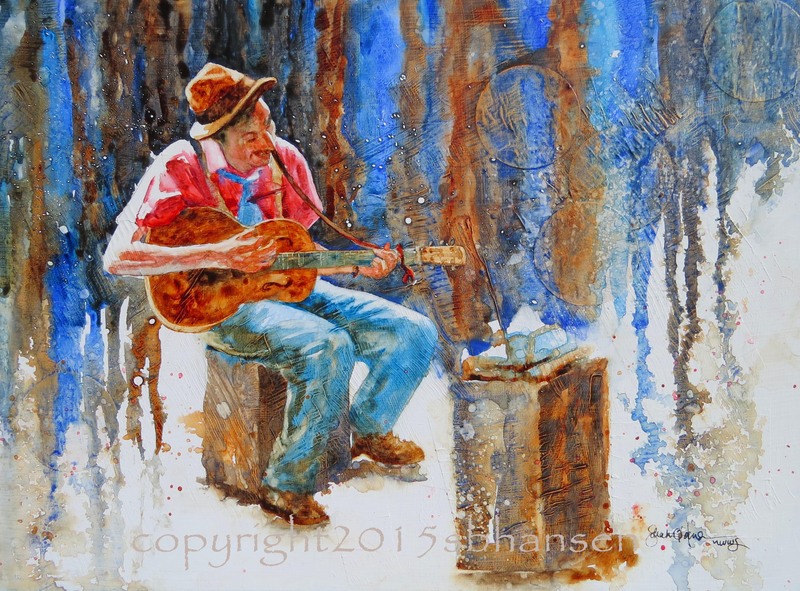 Imagine this jazz guitarist, playing to a crowded market. 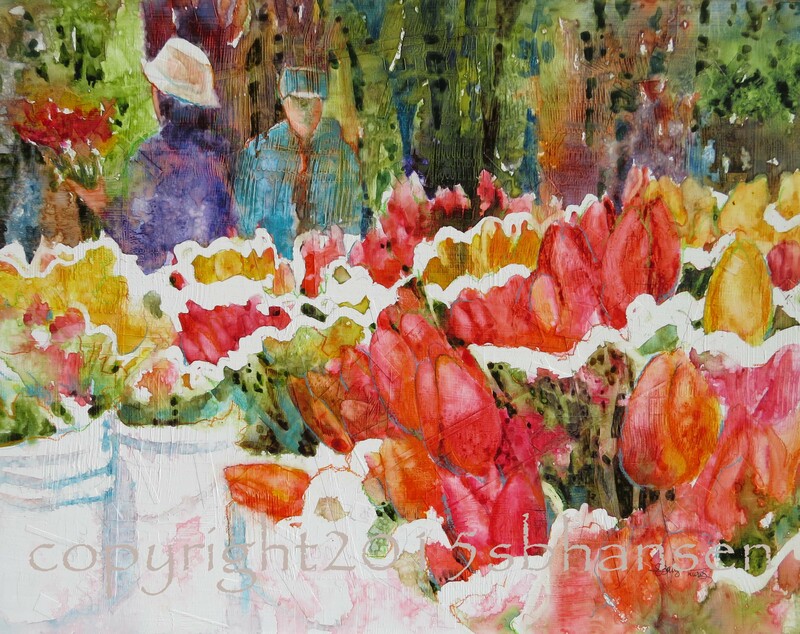 When I drop saturated reds and yellows in a horizontal wave-like pattern, keep some whites, and feed sap green beneath the lines of color, I discover a cheerful image of tulips for sale in a springtime vendor booth. 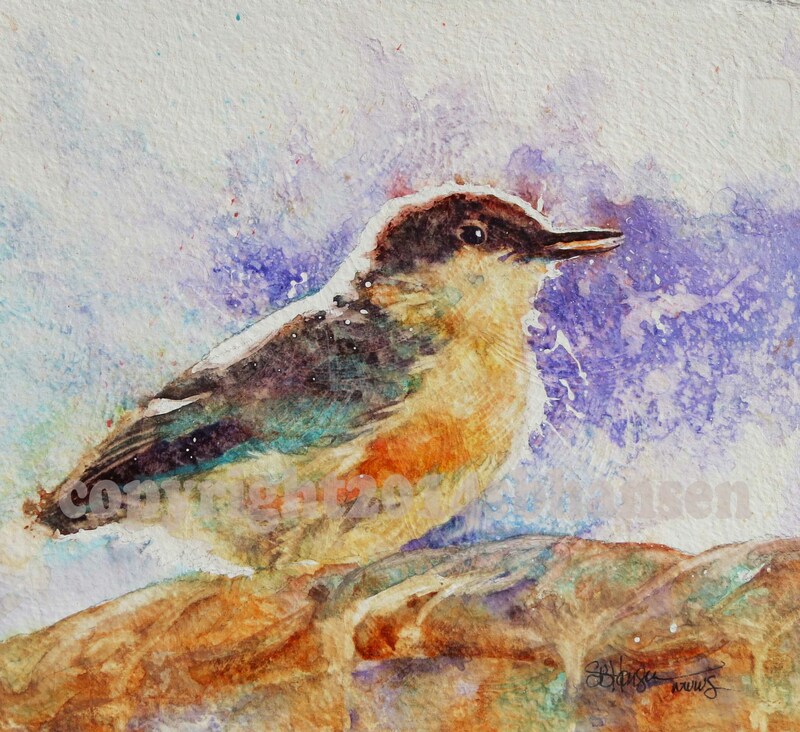 Tossing cerulean blue and purple on a canvas of splattered liquid mask gives us a cute little painting of a pygmy nuthatch, playing in the bird bath. 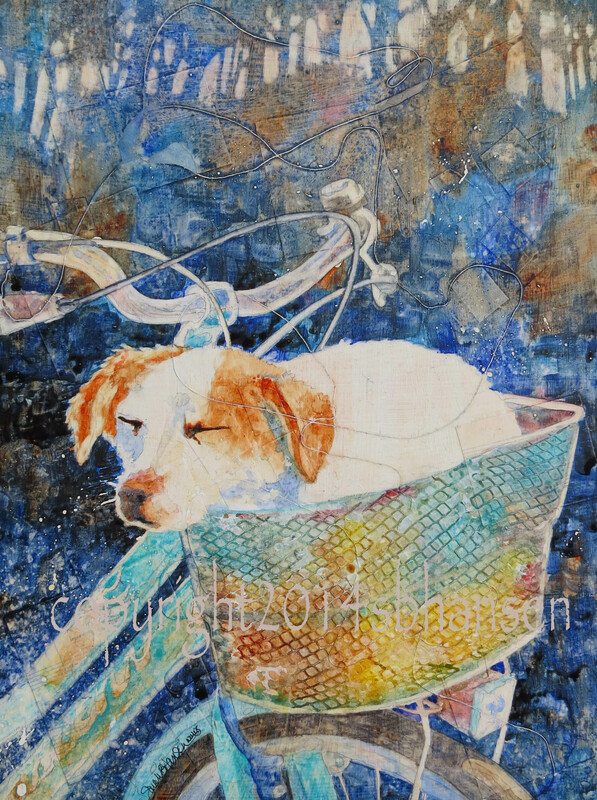 String, netting, and a little salt with deep ultramarine blue creates a feeling of a bike trail, a basket, dust, and a snoozing dog in a happy painting called “Snoozin’”. 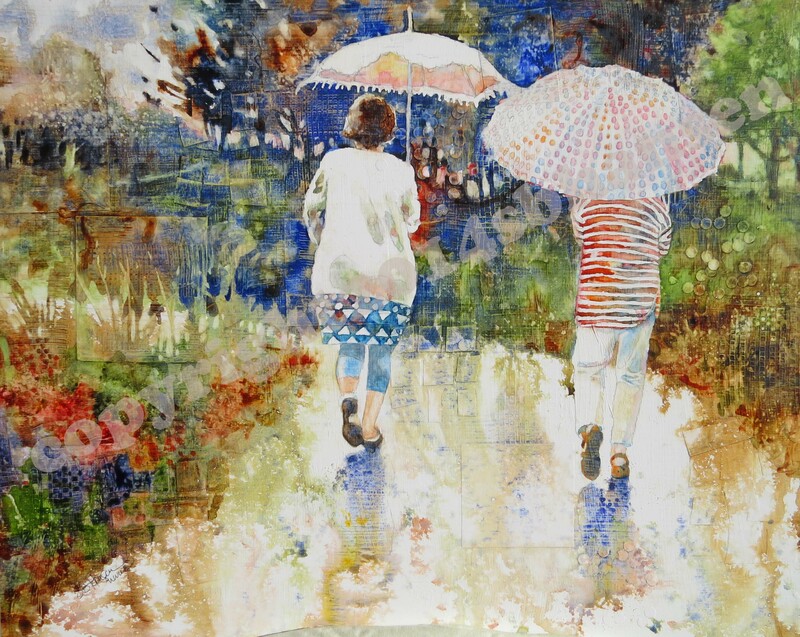 Mixing the colors on the canvas instead of on the palette and allowing the colors to drip like rain gave way to a painting of friendship on a rainy spring day. Oh, yeah. This is fun, loose, crazy painting, just as it looks to be. Dull, muddy watercolours? I don’t think so. I’m sorry, Mrs. Past-Instructor Whatsername, I just don’t think you were the best teacher. Where was your fire? Where was the spark that ignited your students into a painting frenzy? Watercolour isn’t a benign caterpillar munching away at the paper, producing mid-value grey-ness. Watercolour is saturated color, spreading like butter in a hot skillet, dripping and splashing like rain and turning white canvas into a rich and vivid life. And I can’t get enough of it. Sarah B. Hansen, Watercolour Artist.